The newer cloth-bound wheels have a drier texture and earthier, mustier smell. There is a distinct whiff of the aging room, and if you nosh the bit just under the bandage, you’ll swear you’re eating rich, minerally dirt, made firm. 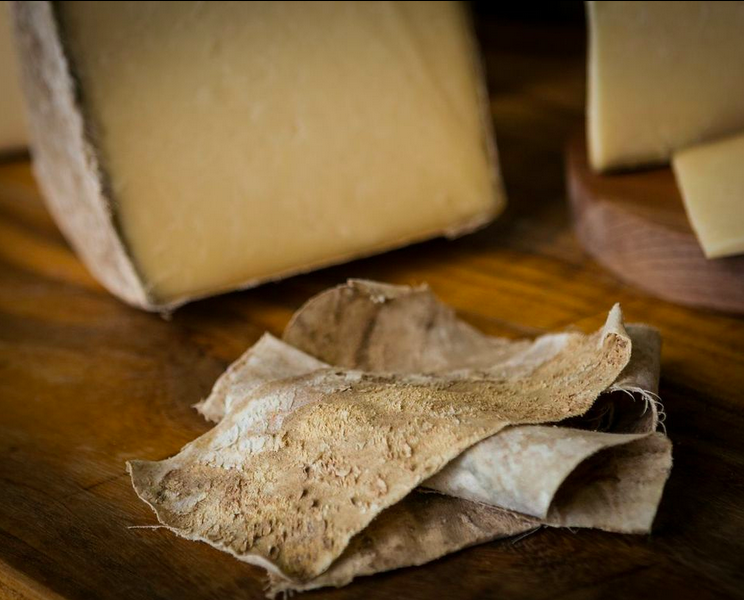 Cheddar as most of us know it, including myself, back to the early Cracker Barrel days, is a bit damp and crumbly, the result of a hermetically sealed cheese whose internal moisture has had no opportunity to evaporate beneath its plastic sheath. The flavor, meanwhile, can be mild and minimal in the case of a youngin’ (a month or two old), or, as most Americans like it, brawny and sharp! with singing, biting intensity and a mouthwatery finish thanks to high, unapologetic acidity. The thing I’m always cautious about when tasting cheddars is bitterness. So many start placidly, rolling up with a little more body, some lemony, slightly sour notes, or perhaps a mellow, sweeter, butterscotch hum, and then, Whap! It’s like someone had you lick a battery. You’re left with a dull mouthful of metal, a whiff of nail polish remover, and a slightly dirty, bitter afterglow. You have to be careful. What joins all cheddar, regardless of size, shape, age or color is that they are cheddared. It is, in fact, a verb, and it refers to the cheesemaking technique unique to this cheese alone. The milk is coagulated, stirred and cut, but then so many extra steps go into honest, earnest cheddar, that it makes the style extremely slow and labor-intensive. The curds are cut into little cubes, a quarter to five-eighths of an inch. As with any cheese, the bigger curds will hold more moisture, and are generally aged for a briefer period of time, the goal being a moister, younger, milder cheese. The smaller curds, when pressed and aged, can get pretty fierce given the proper conditions. The brothy stew of curds and whey is heated and stirred to about 102 degrees, the whey is drained, and then the curds mat up at the bottom of the vat. Remember my anxiety under David Major’s watch to dip and scoop with great expediency? My concern (his concern, really) was that sluggish scooping would give the curds time to solidfy into a gluey mass. With cheddar, you want that solidification. Thanks to higher acidity and some heat, the mass that forms is a wonderful, rubbery, squeaky mat. You could rest comfortably on this stuff if it was dry. From that floppy white curd-mat, loaf-shaped blocks are sliced (often, excitingly and dramatically with a machete-looking apparatus), and then the blocks are turned and stacked. Then they’re turned and stacked again. Sometimes they’re turned and stacked a third time. Then the stacks are left alone, lest they get too high, but the loaf-blocks themselves are turned. This does two things in addition to developing beautifully chiseled back muscles: 1. The weight of the loaf-blocks atop one another presses residual whey from the curd and 2. The warm loaf-block of curd in contact with its warm loaf-block neighbor encourages and enables the development of acidity. In fact, the cheddaring process ends (is dismantled by the cheesemaker) when the acidity reaches a predetermined level. The whey is constantly checked and at a pH of .5 to .7 (remember, a neutral pH, neither acidic nor basic, registers at 7.0, so .5 to .7 is super acidic by comparison), the loaf-blocks are unstacked, the curd is chopped into smaller bits and milled, like sausage meat. Then it’s salted and the squeaky, tart little bits are packed into a form of some size and shape, and aging commences. All cheddars, great and small, must be cheddared, but the resulting cheese can be many things. Even traditional American cheddar, in block, vacuum-sealed form, appears in many guises. I found myself struggling to write about American cheddars, because so many seemed like…cheddar. There is a lot of American cheddar, and most of it is bad. That may be surprising, because much of what you can buy in the supermarket is perfectly acceptable. But there are so many potential flaws to cheddar. Atop my list, and previously mentioned, is bitterness. Nail polish remover is the first awful thing I’m reminded of and bile is the second. Bad cheddar tastes like you just threw up. It gnaws at the back of your throat, it stings your tongue, it feels dry and jagged to swallow. Some people call that “sharp.” I call it gross, unpleasant, and not well made. Sharpness, acidity, should always be in balance. Second to be wary of is texture. Well-made cheddar, regardless of age, should be creamy. The plastic-sealed kind will be wetter, and the cloth-bound kind drier, but there should be smoothness once you bite down. Cheddar that breaks apart into a thousand identifiably grainy bits is not good. Exceedingly rubbery is also not good. Younger cheddar will have more boing, spring and bend, but it should yield undertooth. Remember, of course, that Gumby is so called because he was originally invented for toothless infants to gum as their teeth arrived for an inaugural appearance. Young cheddar might be bend-y, but it should not be Gumb-y. Flavorings are my third area of caution. Second only to Jack cheese (or maybe even first to Jack), cheddar gets flavored with everything from pepper to herbs to horrible concoctions like salsa-lime. Flavored cheese is not, in and of itself, problematic. Sometimes it can be quite delicious and satisfying, especially when it tastes like the flavoring, and not an approximation of the flavoring, and secondarily, when you can still taste the milk (the cheese). The flavoring should be in addition to, not instead of, so you get a balance of approachability, savoriness and a whiff of whatever the flavoring is. Those cautions duly heeded, go explore the thousands of cheddars out there.